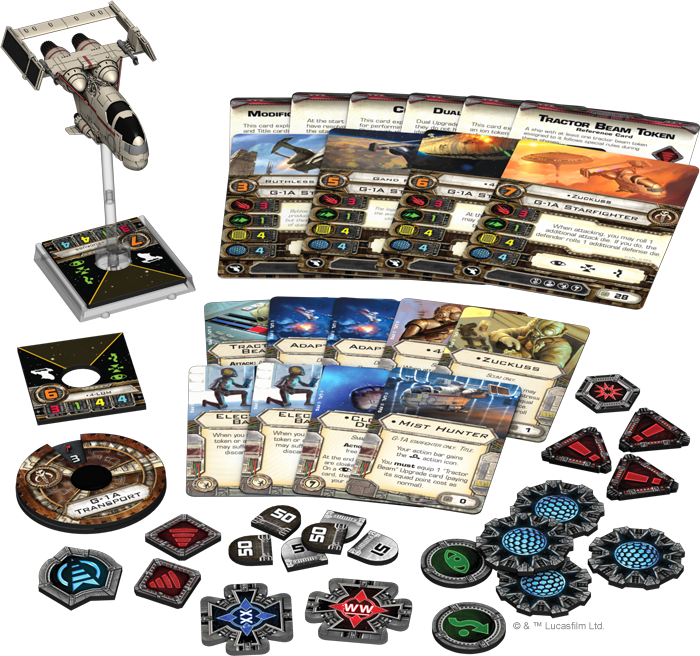 Each wave of X-Wing™ expansion packs introduces new ships for each of the game's three factions—Rebel, Imperial, and Scum. 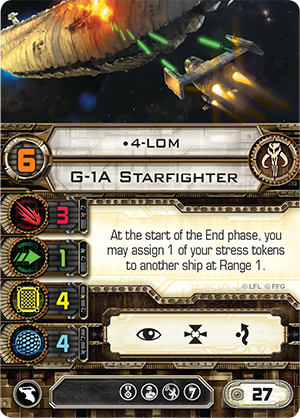 In our earlier Wave VIII previews, we explored the Rebel and Imperial ships and pilots. Inspired by Star Wars Rebels and The Force Awakens, these ships and their pilots are bound to make their mark on the game's battles for the galaxy. But these are not the only ships that will soon be racing through the stars, nor the only ones promising to inspire fear among their enemies. Refusing to be outdone, the smugglers, pirates, and bounty hunters of the Scum faction will fire up the engines of their own new starships—two heavily customized vessels that are every bit as renowned and potent as those flown by their rivals. 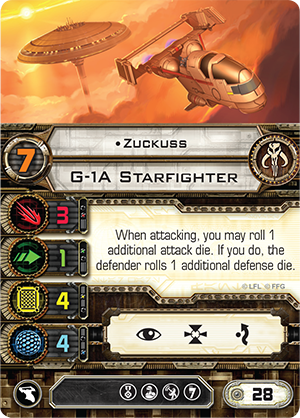 Today, we continue our Wave VIII previews with an examination of the first of these two Scum ships, the Mist Hunter, the heavily customized G-1A starfighter belonging to the bounty hunter Zuckuss. Zuckuss specially commissioned the design of the Mist Hunter to suit his needs as a Gand findsman and bounty hunter, enhancing it with advanced repulsorlift technology, twin assault lasers, a tractor beam, and the ammonia atmosphere that he needed to breathe. As a result, the Mist Hunter is likely the most alien and remarkable of all G-1A starfighters in the Star Wars galaxy. 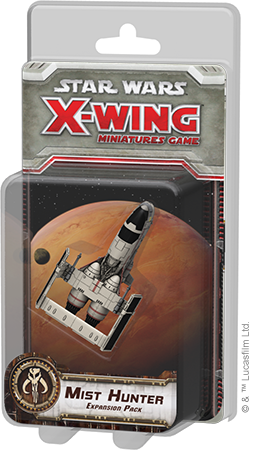 In X-Wing, the G-1A starfighter heads to battle as a small-base ship with a big primary weapon, solid shields, and somewhat limited maneuverability. It boasts a primary weapon with an attack value of three, four shields, and four hull. To these, despite its advanced repulsorlift technology, the G-1A starfighter adds only one agility and features a maneuver dial heavily skewed toward red maneuvers. Of the G-1A starfigher's sixteen available maneuvers, more than one-third of them are red. Red or not, however, the fact is that those maneuvers still exist, and because the G-1A starfighter boasts the system upgrade slot, choosing those maneuvers does not necessarily prevent you from taking actions. You could simply load your G-1A starfighter with Advanced Sensors to perform your action before revealing your maneuver, or you could equip the Electronic Baffle upgrade at two fewer squad points and translate the stress into damage on the rounds you decide you absolutely need your action. 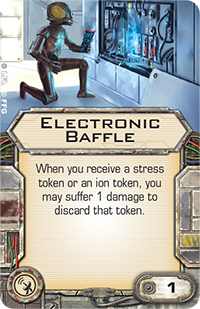 In the process, your Electronic Baffle would also allow you to deny your opponent the control afforded by Ion Cannons and the piles of stress tokens tossed out by BTL-A4 Y-wings loaded with the R3-A2 Astromech Droid and a Twin Laser Turret . Certainly, that denial would come at a heavy cost—in the form of damage assigned to your ship—but if it means the difference between being slowly battered to pieces over the course of multiple rounds or turning the tables on your foe by lining up a deadly kill shot, your ability to keep taking actions and using your ship's full dial may be worth as much as the ship itself. In addition to its considerable stats and system upgrade slot, the G-1A starfighter also boasts the crew and illicit upgrade slots, which permit another host of tricks and surprises, and the Mist Hunter Title upgrade adds the barrel roll action to an action bar that already includes the focus, target lock, and evade actions. What do you get for pilots in the Mist Hunter Expansion Pack? For starters, you get not one, but two of the galaxy's most notorious bounty hunters. Both Zuckuss and his frequent companion 4-LOM appear as pilots within the expansion. The owner of the Mist Hunter and one of the few select bounty hunters tasked by Darth Vader to find the Millennium Falcon, Zuckuss was a male Gand and a practitioner of the mystical findsman tradition. He was also Force-sensitive, and his connection to the Force, as well as his mystical findsman rituals, greatly enhanced Zuckuss's ability to locate people, places, things, and even events. As a pilot, Zuckuss translates his familiarity with the Mist Hunter and his ability to track down his prey into a more powerful attack. 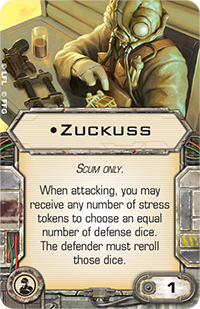 When Zuckuss attacks, you may choose to add one attack die to his pool. If you do, your opponent gets to add an extra defense die to his pool. However, veteran players will recognize that the attack die is slightly more powerful than the defense die, and you can get further mileage from the extra die if you add it to your attack at a time when your dice are modified and your opponent has no focus or evade tokens with which to modify his rolls. A former protocol droid turned thief and bounty hunter, 4-LOM was able to override his original programming due to a glitch in its logic. A frequent associate of Zuckuss, 4-LOM joined the Gand on the deck of the Executor when Darth Vader tasked them to locate and capture the Falcon. While their partnership owed much of its success to the Zuckuss's intuitive findsman talents, it also owed much to 4-LOM's ambitious and calculating nature. 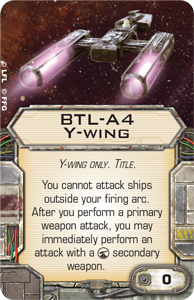 In X-Wing, 4-LOM's unique pilot ability reflects his cold, mechanical nature. Stress does not apply to him quite in the same way it might apply to organic pilots, and he can pass one of his stress tokens to another ship at Range "1" at the beginning of the End phase. 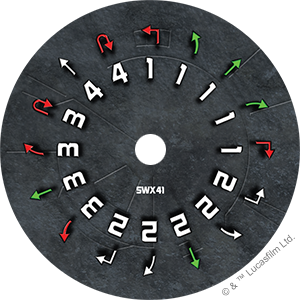 In this way, 4-LOM can utilize his G-1A starfighter's full dial every turn, provided he ends up at Range "1" of another ship, and if that other ship is an enemy ship, all the better. 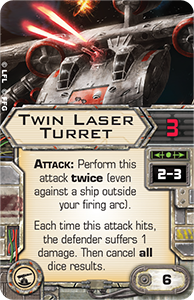 Notably, both Zuckuss and 4-LOM also appear as crew upgrades in the Mist Hunter Expansion Pack, meaning that you can partner the two together, with 4-LOM aboard a ship flown by Zuckuss, or vice versa. As you might expect, their crew talents complement the other's pilot talents nicely. 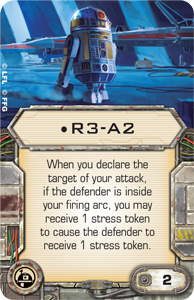 As 4-LOM's crew member, Zuckuss can increase the effectiveness of the droid's attacks by allowing the droid to take stress in order to force the defender to reroll dice. Since 4-LOM can then potentially pass that stress off to his target, Zuckuss's aid therefore benefits the droid's attacks in two ways. As a crew member lending his assistance to Zuckuss, 4-LOM helps the Gand get more punch from each of his attacks. 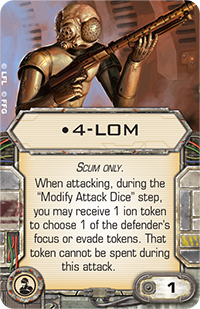 During the "Modify Attack Dice" step of an attack, 4-LOM allows Zuckuss to receive an ion token to prevent his target from making use of one focus or evade token. The partnership's Adaptability is further reflected by the introduction of a new Dual Card elite pilot talent. 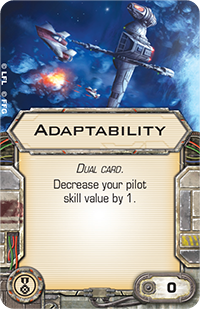 The first zero-cost elite pilot talent in X-Wing, Adaptability allows you to either add or subtract a point of pilot skill from any of your pilots with the elite pilot talent slot. 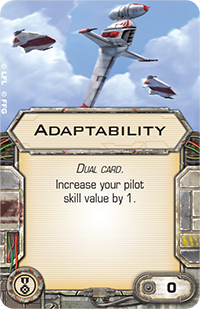 The card's introduction as a zero-cost upgrade means that players everywhere will soon have an elite pilot talent upgrade that they can add to any squad for which they previously had no upgrade options in budget. Accordingly, it is bound to make appearances nearly everywhere, and you will find two copies of the upgrade in the expansion. 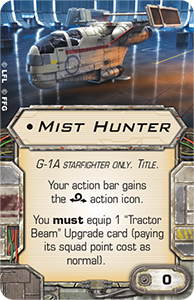 Finally, the Mist Hunter Expansion Pack introduces one of the most hotly anticipated cannon upgrades ever, the Tractor Beam . The idea of the tractor beam has made an indelible mark on the Star Wars™ galaxy ever since the Millennium Falcon was pulled into the Death Star during A New Hope. 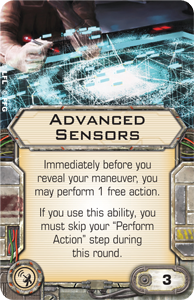 Bringing the tractor beam to X-Wing, however, required a bit of finesse, as the game is largely about maneuvering, and it could be harmed by introducing effects that detract too heavily from that focus. 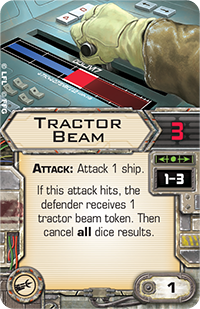 In the end, though, the Tractor Beam and the tractor beam token that it assigns to its target strike a nice balance between the weapon's iconic utility and its implementation into the game as a powerfully disruptive, temporary effect. 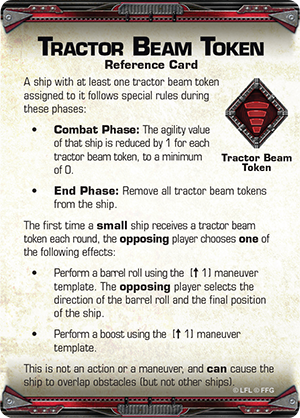 When the Tractor Beam successfully hits a target, it deals no damage, but the target loses a point of agility for each tractor beam token assigned to it. Perform a barrel roll using the straight speed "1" maneuver template. You select the direction of the barrel roll and the final position of your opponent's ship. Perform a boost using the straight speed "1" maneuver template. 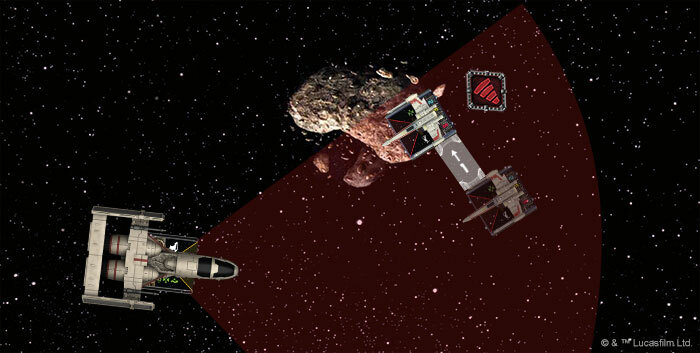 Forcing your opponent's ship through this boost or barrel roll does not count as an action or a maneuver, and you can force the ship to overlap obstacles, meaning that if you catch your opponent's ship in the right spot, you can potentially deny it the chance to fire and perform actions in the following round. Moreover, you may get as many as two points of damage out of the collisions, depending on the results of your opponent's attack dice. With its Tractor Beam, its devious pilots, its Cloaking Device, and all the other tricks at its disposal, the Mist Hunter is far more than just another G-1A starfighter. It is a signature vessel wholly worthy of its two renowned bounty hunters and easily one of the trickiest ships the Scum faction has in its arsenal. Make sure to get your copy of the Mist Hunter Expansion Pack. Head to your local retailer to pre-order your copy today!